A caution has been issued to business owners in Lurgan, following two incidents in recent days. The Mace on Victoria Street was the target of an armed robbery on Monday night, while Wray Cleaners, located on Union Street, was broken into in the early hours of Saturday morning. Staff at the convenience store were subjected to threats from an armed robber on Monday night, when the man entered the Mace at around 8pm. Police reports state that the man had his hood up and his face covered with a scarf, and had a firearm in his possession. “He threatened and demanded money from two shop assistants,” a statement read. Meanwhile, staff at Wray Cleaners arrived at the cleaning business on Saturday morning to find that the safe had been stolen. “We have a metal gate at the front of the shop - they pulled the padlock off and kicked in a panel on the door,” explained a staff member at Wray Cleaners. SDLP Councillor Declan McAlinden spoke out against Monday’s armed robbery, noting its proximity to the location of the explosion on Saturday. “I condemn the latest incident in Victoria Street, Lurgan where the owner of a local Mace shop was robbed at gunpoint. This comes after a weekend when his shop was affected by the bomb alert and at a time when businesses are struggling. The owner said his member of staff was left very shaken and scared by the whole incident and in 25 years trading this was the first such incident. 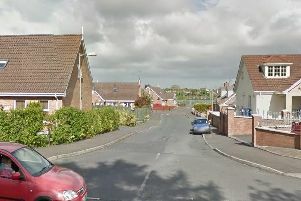 Police are appealing for information on both incidents, and can be contacted in Lurgan on 101.